Both feature our exclusive SFC-5 Grip enhanced slip-resistant outsole with extra-wide channels for easy maintenance. Impact Resistant Cushioned Insole and Shock-Absorbent Outsole. Anti-Bacterial, Non-Marking SFC III Slip-Resistant Outsole. Resistant Against Hydrocarbons, Animal Fats & Vegetable Oils. High Flexibility and Resistance at Low Temperatures. Shoes for Crews Guardian Safety Wellington conforms to: EN ISO 20345 SB standard. SFC-5 Grip enhanced outsole with extra-wide channels. White PU safety S4 Wellington is the first choice for any food-processing environment. Millions of air bubbles cushion and insulate the foot while the slip-resistant sole keeps you sure-footed. The Dunlop Acifort Classic is designed for the Food Processing Industry. The very smooth surface gives the boot excellent hygiene and makes cleaning easier, the boot is less prone to staining, so white stays white. The Dunlop Acifort Wellington is antistatic and offers acid resistance, animal and vegetable oil resistance, resistance to greases, blood, chemicals and cleaning agents. Steel Toe Cap Protection Against A 200 Joule Impact. Sole is resistant to acids, bases, disinfectants, minerals, animal and plant oils and fats, blood, various chemicals. The boots comply with the highest requirements in the area of hygiene and safety. Dunlop Acifort A681331 White Safety Wellington Conforms to: ISO 20345 SB A FO SRA. The Protomastor FS1800171BV is a sturdy wellington from Dunlop. It's made from a tough PVC/Nitrile upper. It is fully resistant to minerals, vegetable oils and fats and blood, disinfectant and various chemicals. The Protomastor conforms to EN ISO 20345:2011.SB.E.FO.SRA safety footwear standards. Toe protection up to 200 joules impact and penetration resistance. Amblers FS98 are an ideal choice for catering, industrial applications, or farming. These have a high resistance against numerous minerals/chemicals/oils, and are simple to wipe clean. The steel toe cap is tested to 200 joules impact, and the waterproof PVC sole has excellent slip resistance. Suitable for men and women. Dunlop Acifort wellingtons ideal for Food Industry with waterproof PVC/Nitrile upper. Impact and compression resistant toe cap to 200 Joules impact. Anti-static Classic+ safety Wellington with an energy absorbing heel. Slip resistance SRC – prevents from slipping on both ceramic and steel surfaces covered with water and cleaning products. Complies with EN ISO 20345:2011 safety standards. Acifort Classic Work Wellingtons from Dunlop with Toe and midsole protection. A safety wellington with a very smooth shaft for excellent hygiene in the food industry/factory. Easy to clean and sanitize shaft and sole. Resistance to minerals, animal or plant oils and fats, blood, disinfectants, fertilizer and other various chemicals. High Quality safety wellies specifically designed for the food industry and any other application where dirt contamination is a major issue. Extra thickness in sheen and heel area for impact cushioning. Monodensity PVC outsole: exceptional abrasion resistance and ideal for environments where oils and solvents are used. Blackrock SRC05 Hygiene Safety Wellington conforms to: EN ISO 20345 S4 WR SRC safety standards. Vital Groundworker Yellow Safety Wellington is a general-purpose safety toecap and puncture resistant midsole wellington. A reinforced toe and shin, moulded heel stabilizer and anti-static design are just a few of its attributes. Made with the same technology as the VW600 Alpha, the Vital Alpha Yellow PU Safety Wellington will keep you warm and safe all day. It also includes an anti-microbial footbed for comfort and hygiene. SRC Rated anti slip, anti static, ideal for the food industry, abattoirs, butchers, medical, catering. A new generation of Purofort CA61131 boots for the Food Processing segment Industry. The Dunlop FoodPro Multigrip boot has been specifically developed for food processing. Easy clean thread for great hygiene practice, protection with temperatures as low as -20c, resistant to chemicals, fats & oils. Extra smooth design and shaft: easy to clean, Anti-Bac Anti Bacterial Lining. Specifically designed for orthopedic insole. Resists Mineral, animal and vegetable oils and fats, manure, blood, disinfectants, solvents and various chemicals. Dunlop Purofort CA61131 FoodPro Multigrip boots conforms to: EN ISO 20345:2011 S4 CI SRC standards. 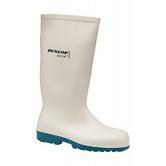 Dunlop Wellington Boot in white colour. An ideal boot for temporary workers or for those who work in areas with a low risk of slipping. White colour is the choice for the food industry for hygiene purpose. Non-Safety wellington completely smooth Nitrile Rubber / PVC upper for excellent food factory hygiene, easy clean sole and upper. Durable and Resistance to: animal & vegetable oils & fats, Acids, bases, Minerals, blood, disinfectants, various chemicals. 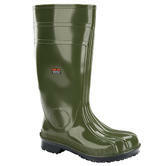 Safety Wellingtons are manufactured from virgin PVC/Nitrile in a seamless watertight construction. Featuring rubber reinforcement in the toe, heels and shin bone area for extra protection and duration. Antistatic Portwest FW95 Total Unisex S5 Safety Wellington Boots with Energy absorbing heel, Steel toe cap protection tested to 200 joules impact and Steel midsole penetration resistant to 1,100 Newton. Dual Density PVC\Nitrile sole: exceptional abrasion resistance and ideal for environments where oils and solvents are used. Portwest FW95 Total Unisex S5 Safety Wellington Boots Conform to EN ISO 20345:2011 S5 SRA European Standards. Sturdy wellington from Dunlop, it's made from a tough PVC/Nitrile upper. Antistatic properties and energy absorbing heel. The Dunlop Protomastor 171BV Safety Wellingtons conforms to: EN ISO 20345:2011 - SB E FO SRA safety footwear standards. 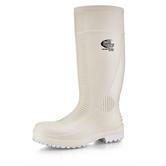 White safety wellingtons with high grade of resistance to oils, fats, alkali and acids. Widely used in chemical and food processing industry. Antistatic Portwest FW84 Steelite S4 Safety Wellingtons with Energy absorbing heel and Steel toe cap protection tested to 200 joules impact. 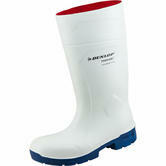 Portwest FW84 Steelite S4 Safety Wellingtons Conform to EN ISO 20345:2011 S4 SRA European Standards. 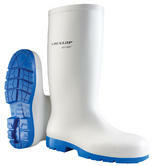 We stock white and blue safety wellies suitable the food industry. They are fat, oil and acids resistant and have easy clean lugs. The Dunlop FoodPro CA61631 are ideal for working in factories, they conform to the hgighest level of hygiene. The durable outer protects the boot and your feet against fats and oils, whilst giving you a comfortable all day experience. Some of the food indsutry wellingtons have Shoes for Crews patented slip resistant soles|: SFC is the best design AND wellington material for workers walking on slippy, oily wet tiles; Other safety wellies are thermal insulated - to keep you warm in cold conditions. This is one of the more popular food industry safety wellingtons Food industry wellingtons. Not what your looking for ? Then why not check out our entire Catalogue !